Over 20 million people in North America lack access to fast, affordable, and reliable Internet. 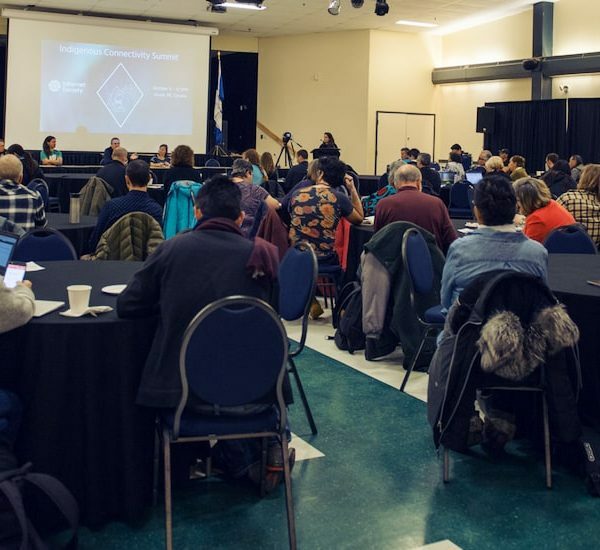 In October 2018, the Indigenous Connectivity Summit gathered over 150 Indigenous leaders, policymakers, network operators, and community members in the Canadian Arctic town of Inuvik to focus on a common goal: bringing fast, affordable, and reliable Internet to Indigenous communities. The event featured success stories of community networks across North America to demonstrate the power of communities to lead their own Internet solutions, and how anyone can support them. Crystal Gail Fraser, a Gwichyà Gwich’in woman who calls Inuvik home, sees collaborative Internet solutions as a critical path to self-determination for her community. As I stepped off the plane in Inuvik, I inhaled the arctic air. 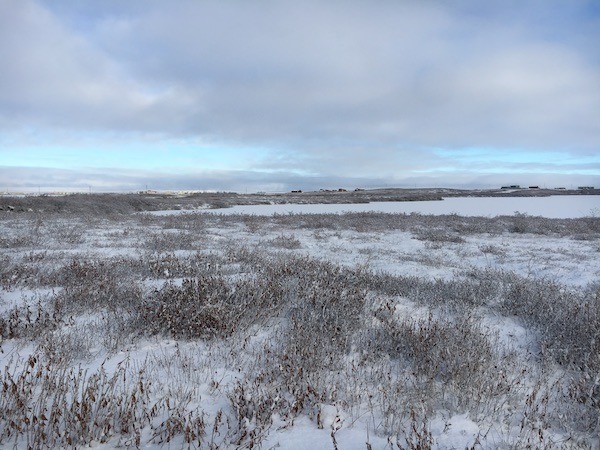 I observed the scenic landscape of Dinjii Zhuh (Gwich’in) and Inuvialuit territory, taking in the familiarity: the snow-covered rolling hills, stunted spruce trees, and ice crystals in the air. This land and all that it holds, means, and represents, has been critical to Dinjii Zhuh culture, economies, and lifestyles since Ts’ii Dęįį (Time Immemorial). “My dìdųų (grandmother), Marka Andre Bullock, was a fierce Gwichyà Gwich’in fisherwoman and always reminded me of the importance of our connection to the land. Surely, she learned that from her own mother, Julienne Teh’dahcha Andre, who helped negotiate Treaty 11 in 1921 and made her living as a multilingual trapper. Inspired by Marka and Julienne and mentored by my mother, Juliet Bullock, my PhD research is a family history of sorts. I examine the history of residential schooling in Nanhkak Thak during the second half of the twentieth century. In a side project, I explore how Dinjii Zhuh have used oral histories and communications in a changing world. A partnership between the University of Alberta and the Gwich’in Tribal Council, the Gwich’in Digital Literacy project is developing digital literacy workbooks for communities. My role has been to incorporate Dinjii Zhuh understandings into the content, design relevant learning/teaching models, conduct interviews with local digital innovators, and serve as a cultural consultant. 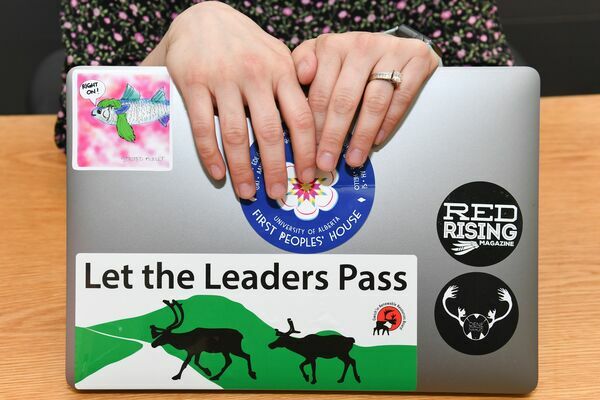 At the Indigenous Connectivity Summit, and in northern Canada in particular, concerns about reliable connectivity, data caps and usage, Internet speed, and cost dominated conversations. And although the recent completion of the Mackenzie Valley Fibre Optic Link brought high-speed Internet to the region, many people continue to express discontent around connectivity and accessibility. A highlight was hearing Gwichyà Gwich’in Elder, knowledge keeper, and former residential school student John Norbert of Tsiigehtchic offer remarks in Dinjii Zhuh Ginjik. He encouraged the learning of our language and noted how language revitalization is inherently linked to the implementation of new technology. Indeed, this is critical for Dinjii Zhuh as there are less than 400 fluent speakers today. Gwichyà Gwich’in Elder, knowledge keeper, and former residential school student John Norbert of Tsiigehtchic offering remarks in Dinjii Zhuh Ginjik. 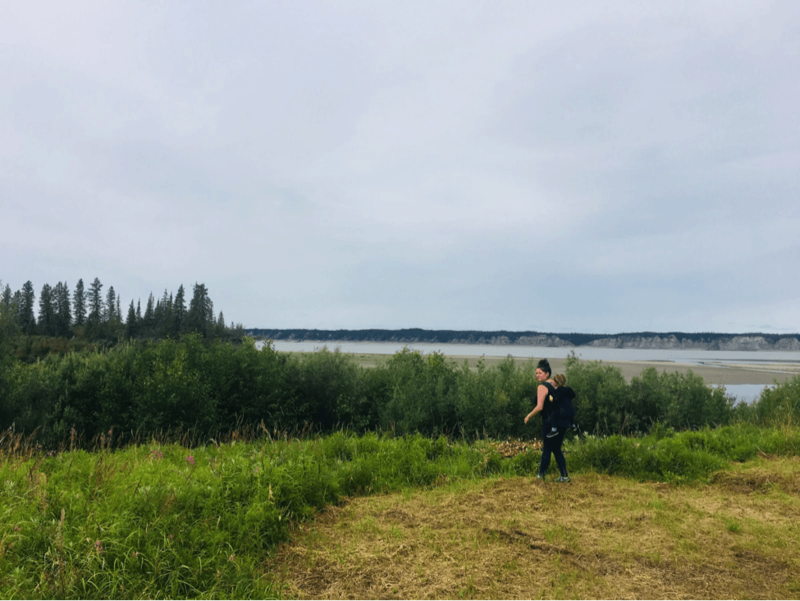 During the event I was exposed to new people and new ideas, and, for the first time, I thought about the networks and infrastructure that connects Inuvik, a town of nearly 3,300, people to the world. 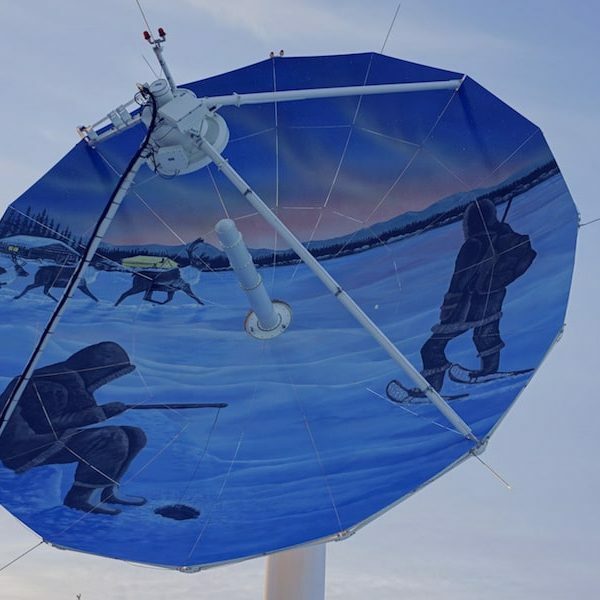 From mail delivery by dogteam to the establishment of aviation in the 1920s to the rise of radios, Distant Early Warning (DEW) Line sites, and early satellite planning, Inuvik is now connected internationally through the Internet. 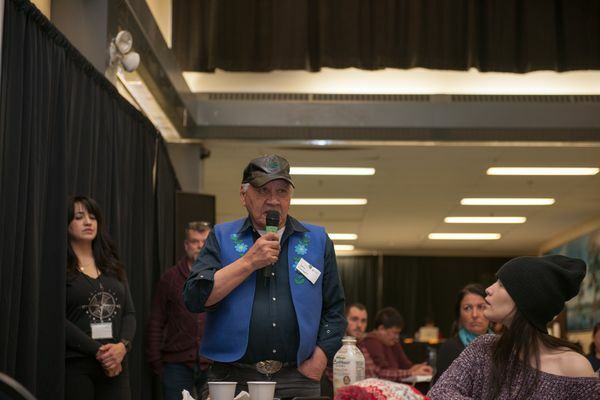 The Indigenous Connectivity Summit offered participants an intriguing peek into Dinjii Zhuh and Inuvialuit cultures and traditions. It also showed how Indigenous northerners are critical to global conversations about connectivity and leading their communities to better ways to engage with the world. We are grateful to Treaty 6/Métis nations for hosting us as guests on their land. The blog post was written in Edmonton, where photos by Candice Ward were captured. Jii University of Alberta Treaty 6 guuk’iigeh’ jii nanhkak guu’ ęįh. Jii dinjii zhuh ttak Cree, Métis, Saulteaux, Niisitapi, ts’at Nakota Sioux niizhet gwits’at. Jii nanhkak łatr’idàł guulùt zhidąh gwì’àn guugweech’ìn. The University of Alberta is located in ᐊᒥᐢᑿᒌᐚᐢᑲᐦᐃᑲᐣ(Amiskwacîwâskahikan) on Treaty 6 territory, traditional lands of First Nations and Métis people. Community networks are communications infrastructure built, managed, and used by local communities. They provide a sustainable solution to address the connectivity gaps that exist in underserved urban, remote, and rural areas around the world. 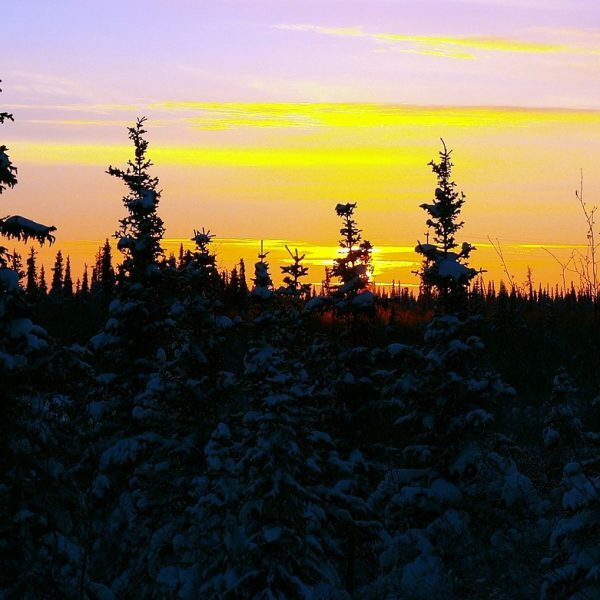 The Internet Society is working with communities in the Northwest Territories to provide training, support, and funding to lead and develop their own sustainable community network solutions.